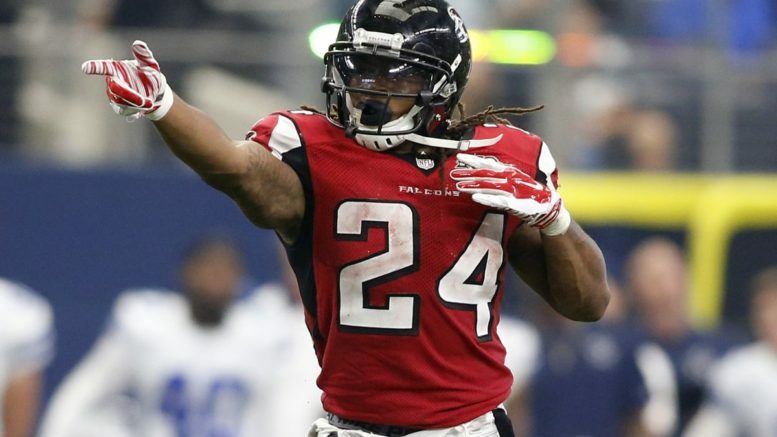 Devonta Freeman and the Falcons can win the NFC South for the second year in a row with victories in their final two games against the Saints and Panthers. Ah, the fruits of a near-perfect week. After a brief skid, I’m back on track, going 5-1-1 last week and sitting pretty — well, prettier — than I was after Week 15. Without further ado, here are my Week 16 picks. Uh-oh, don’t look now, but here come the Falcons again, presumably ready to go on a run (until they choke away a big playoff lead, that is). Kenny Vaccaro going to IR really hurts the Saints, who didn’t exactly dominate the Jets last week. Atlanta is going to give New Orleans all it can handle, especially after upending them two weeks ago on a Thursday night. Expect a lot of points and a close game in a rivalry that is never devoid of big plays. Pick: Falcons. Why not ride the Skins again? Denver is turning to Brock Osweiler, who shouldn’t pose much more of a problem that Blaine Gabbert did (or didn’t, depending on your perspective) last week. The Broncos are toast at 5-9, as are the Skins at 6-8, but Washington should have just enough at home to get by and possibly finish 8-8 with a win next week over the Giants. Pick: Redskins. Why not give the Dolphins a fighting chance? The Chiefs have come back to life after a dismal 1-6 stretch and are in line to win the AFC West. They shouldn’t falter at home against Miami, but the Dolphins are the kind of team you can never quite figure out, meaning that keeping it close is a distinct possibility. With the Chiefs starting to hear how good they are again, it might just knock them down a peg and let the Dolphins squeak out a cover in this one. Pick: Dolphins. The Panthers may well just be the best team in the NFC. The Buccaneers may well be the year’s biggest disappointment. Carolina knows it has to win with New Orleans and Atlanta going head-to-head, and the Bucs may be a little bit emotionally spent after putting up a fight against the Falcons on Monday night. It could fall into the category of a trap, but the Bucs simply don’t have enough in the tank to hang with a team of the Panthers’ caliber. Pick: Panthers. The Rams can smell their first NFC West crown since 2003, and the whole world can smell the Titans’ desperation. Tennessee probably doesn’t have enough firepower to hang with the Rams, but alas, this has the feel of a trap game for L.A. The Rams know that even with a loss, they simply need a win in Week 17 to take the division crown. Tennessee has two tough home games to end the year with the Rams and Jags, and should keep this one just close enough for the cover, even if an upset might be a stretch. Pick: Titans. Be the first to comment on "NFL Week 16 Picks: Taking Momentum Into Christmas"